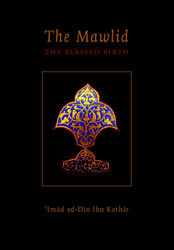 This book, which is a lesser known work of Imam Ibn Kathir, seeks to present the circumstances surrounding Quraysh and ‘Abd al-Muttalib, the grandfather of the Messenger of Allah (may Allah bless him and grant him peace), some of the premonitory dreams and oracular announcements of his coming, and the birth itself and early years of the Messenger of Allah (may Allah bless him and grant him peace), some of his outstanding merits and noble qualities of character, and traditions relating to his high position as the Chosen One (Mustafa) and Beloved(habib) of Allah and Seal of the Messengers of Allah. The author’s careful choice of traditions and his sifting the original material from the earliest sources is here reinforced by the modern editors of the text and their judicious checking and assessment of the traditions cited. The Imam, hafiz and historian ‘Imad ad-Din Abu’l-Fida’ Isma'il ibn ‘Umar ibn Kathir was born in 701/1301 near Busra in Syria, and grew up in Damascus where he studied the traditional sciences of Islam with a wide variety of teachers, among the most famous of them being Shaykh ‘Alam ad-Din al-Qasim ibn Muhammad al-Barzali and Hafiz Jamal ad-Din Abu’l-Hajjaj Yusuf ibn ‘Abd ar-Rahman al-Mizzi. However, it is as a student of Shaykh al-Islam Taqi ad-Din Ahmad ibn ‘Abd al-Halim ibn Taymiyah that he is best remembered. He is well known for his historyal-Bidayah wa’n-nihayah, his work on the biography of the Prophet (may Allah bless him and grant him peace) as-Sirat an-nabawiyyah and his work on Qur’anic commentary Tafsir al-Qur’an al-‘Azim. He died in Damascus on Thursday 26th Sha’ban 774/1373 and is buried there by the side of his shaykh Ibn Taymiyah, may Allah have mercy on them both, in the Sufi Graveyard.